(2) there are substantial negative 'sustainability' impacts, arising from changes in land use for biofuel production - for example deforestation, water impacts or land shortages. Beyond rhetoric, we appear almost indifferent to these. Despite these weaknesses, we now have extremely powerful and expensive policy instruments devoted to promoting biofuels. These are ambitious targets set at EU level (EurActiv and appendix below) and the Renewable Transport Fuel Obligation introduced in the UK to meet the EU targets (DfT RTFO pages). Expensive emissions reductions. I've drawn the chart above from data from the government's UK Biomass Strategy [Working Paper 1 - Economic analysis of biomass technologies, Table 30 /spreadsheet /XLS]. It shows that the RTFO is focussed at the most expensive end of the range of biomass options. In fact, these are at the expensive end of all carbon abatement technologies - perhaps 10 times the going rate in the EU Emission Trading Scheme. But the RTFO is supposed to save 3.6 million tonnes of CO2 (1 MtC - see Energy White Paper 7.31) by displacing 5% of petrol and diesel sales... that's about 2.5 billion litres of fuel. Huge subsidies. Normally with these obligations, you would expect the consumer to pay any premium cost associated with meeting the obligation as the supplier just passes higher costs through. The subsidy system that underpins the RTFO will cost about 30p/litre in 2010-11... of which 20p is carried by the taxpayer (does the polluter pay? Er... no) through a discount of fuel duty and the rest will be passed on to consumers (see Transport FAQ]. 30p subsidy on 2.5 billion litres is a lot: £750 million per year - £500m from the taxpayer. No wonder the farmers like it. Ludicrous carbon costs. The implied carbon price in the RTFO is over £200/tonne CO2 (higher than the figure in the chart above). That same £750m/year spent through the EU ETS at a future price of £20/tonne CO2 would realise savings of about 10 times as great as the RTFO. 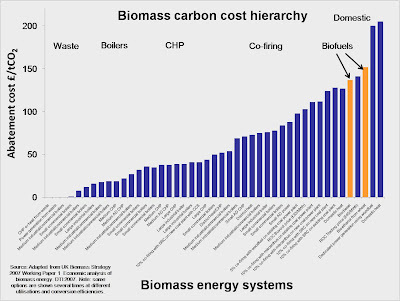 Also, as the chart shows, you would also get much better value for money from almost any other biomass investment. So our biggest instrument is pointing in the wrong direction - and it is extremely inefficient and wasteful. For transport to reduce its climate change impacts we need to enable smarter, more energy efficient use of transport and we need to reduce carbon emissions by bringing about changes in the types of vehicles and fuels we use. ... despite their higher cost of carbon, transport biofuels are essential to carbon savings in the transport sector for which there are few other options in the short to medium term. But this is the simplistic thinking... we should get the emissions reductions where lowest cost and least damaging overall. The issue is that no-one has the policy brief to optimise these resources: but there is plenty of muscular transport policy-making going on - trying to do the wrong thing well, and establishing a meaningless policy priority. Land grab. The effect of this is that transport-related climate policy lays claim to a big expanse of agricultural land, in Europe and beyond, to grow the necessary crops supported by huge subsidies passed through to grateful/greedy farmers. This brings about land-use changes and the various forms of collateral damage that flow from that. But this is completely the wrong way to determine this sort of policy: the real question should be how do you get the best climate change result from the land use policy? Because the current policy starts from the silo of meaningless transport priorities, it ends up doing the wrong thing with land. Start from land-use and you may do much better for the climate overall, even if that means lower emissions reductions from transport. But what is the aim...? It's the climate! Using land in a way that reduces carbon dioxide emissions more cost effectively would either reduce the land-take and agricultural impacts for a given result, or it would allow for a greater beneficial impact on the climate for the same land take. Not only is it an important economic objective to to get the economics of climate change right, it is important for the environment. Grow forests instead...? An excellent articulation of this idea appeared in August in the journal ‘Science’ [article][bootleg PDF] discussing alternative uses for land and challenging biofuels subsidies. They argue that using land for forestry can be far more effective than growing biofuels in carbon terms over 30 years. In all cases, forestation of an equivalent area of land would sequester two to nine times more carbon over a 30-year period than the emissions avoided by the use of the biofuel. Taking this opportunity cost into account, the emissions cost of liquid biofuels exceeds that of fossil fuels. But could they get cheaper if we invest now...? the stand-by excuse of technology-promoting scoundrels everywhere is that we need big subsidies now to prepare for the brave new dawn tomorrow. I agree you need an innovation system - but it's not obvious that you get to cheap second-generation biofuels via lavish subsidies for a very large uptake of expensive dead-end first generation biofuels. For now, the best transport responses are fuel efficiency and changes in driver behaviour. Longer term it's about mobility demand and the physical layout of our lives. It is probably better to grow or regrow forests and ensure that they aren't cut down than rush into biofuels. It is better to use land for almost any other biomass technology than biofuels. More generally, we should see land as one of the resources available to address climate change and build the optimum approach from land-use policy, not let imaginary imperatives in transport policy cause arbitrary and inefficient land grabs. We do not have an adequate system for asking the right questions about biomass, biofuels and land-related carbon policy - and that needs to change. Bloody brilliant Clive. Here in New Zealand we have to contend with policy-makers who simply ape the UK in order to get a trip. NZ is in the invidious position that we profit hugely from increased food prices while we could, if we wanted, grow vast numbers of trees. Thus the distortions of the implied carbon price due to biofuel dwarf the actual carbon market returns from growing trees. This results in deforestation which the Government is now running around trying to stop by fining people for the carbon loss. How dumb is that? Clive, I just came across your blog. Wonderful stuff! (And thanks for the plug of our work.) You've posed exactly the right questions on biofuels. You might want to contact Tim Searchinger at the German Marshall Fund of the United States; he has also been arguing that it would be more cost-effective to reduce greenhouse gas emissions by planting trees or storing carbon in soils than growing crops for liquid biofuels. I found your blog on the EU budget also very informative. I went searching for an e-mail address for you, but couldn't find one. Please send me a message. I'd like to find out more about what you're doing these days. Thank you Clive for putting the spotlight back on landuse. I agree with the general critique of biofuels -- that the focus on alternative ways of producing energy is myopic and misses the target. The fundamental question that we now face is are we going to focus on energy or earth, on fuel or fruitfulness. The basic problem with biofuel approaches is that they give overwhelming attention to supplying energy, albeit in more "sustainable" and “cleaner” forms. And, as you suggest, it is spin -- spin to hide or rationalize enormous (and wasteful) agricultural subsidies that continue to damage the earth. But I'm not so sure about the counter proposal of tree-planting. I'm a tree hugger with years of experience trying to save ancient forests. Let me say, unequivocally, I have never seen large-scale tree-planting without the intention of some future "harvest". The whole tree-planating commericial forestry schema is about agricultural and monocultural "cropping." As we speak, the labs are genetically manipulating trees for better ethanol production and fast growing ecalyptus is being planted massively in Brazil for "green charcoal" to fire the steel mills. And -- get this! -- even if the planted forests are left forever, the resultant system is an equibilbrium between GHG release through decay and GHG retrieval through growth. Yes, tree-planting holds the promise of being more "carbon neutral" than coal and petrol but it's neither "carbon negative" in the atmosphere nor healing on earth. It's just, as you suggest, a greener way to continue some really bad habits. So what can be done? I believe that the answer lies now in Bali where the Kyoto protocols will soon be revised. The definitions of carbon sequestration are critical. First and foremost, there needs to be carbon credit given for reduced or avoided deforestation of EXISTING natural forests. Today, due to burning and deforestation, Brazil is the number 4 greenhouse gas polluter in the world. It gets NO reward or payment for massive government efforts to protect its forests and these efforts usually fail because of illegal logging that responds to market demands -- all the economic incentives push deforestation. Carbon credits can change this by channeling billions of bucks into rainforest presevation and by generating local economies invested in conservation. Forests are local, and so are the people who protect or destroy them. But the incentives are global! Second, even more critical but far less understood, is the need to offer credits for carbon sequestration in the earth -- NOT as CO2 pumped into deep underground caverns but as charcoal amendments to the soil. YES, charcoal put into the soil increases it's fertility, stores more nutrients (think less fertilizer), holds water and filters what is released, pulls more CO2 out of the atmosphere due to faster plant growth providing greater production of both fuel AND food, and the charcoal can be made out of agricultural waste. How's that for a win/win/win/etc? But there's a hitch -- the energy market is demanding charcoal as fuel not as a soil amendment. What will cause farmers to make the longer-term investment in soil restoration rather than reap immediate profits from selling the charcoal? THE CARBON EXCHANGE CAN PRODUCE THE NEEDED ECONOMIC TIPPING POINT. Those who have no immediate choice about polluting ways -- airline companies for example -- can fund those who have a choice but incur lost opportunities for short-term profits if they do the right thing. We can leave the blame-game and help each other. What a concept! It's all based on recent discoveries of an ancient Amazon indian technique called Terra Preta and current research aimed at creating a modern version called Agrichar. We need to fund a crash program of the needed R & D. Again, this will be likely if the carbon market provides serious incentives for carbon sequestration in soils. Please check out the following links to discover more about this exciting possibility. Hi Clive, great blogging, can you contact me, tony at tgtips dot com, or Skype tgtips, I want to talk to you about Green, and maybe interview you for a Green/Sustainable podcast show. I think there are some other issues involved too. Reducing dependence on foreign oil means less funneling of dollars into regimes that use that money in ways our governments don't approve of. Also, in some sections of the world, when cellulose based biofuels are considered, there is a lot of available land which isn't forested and which isn't necessarily being used for food production. However, yes, of course, when we get mandates we get strange distortions to proper economic behavior, there is no arguing with that. Thanks for the comments folks - Lou - a really interesting contribution I raised the question about tree planting instead more to illustrate that there is a discussion to be had focussed on optimum use of land in the service of policy aims, rather than to advocate a tree planting strategy. In sharp contrast, we have had arbitrary policy-making that appears indifferent to land-use optimisation. Heatwatch - I agree that security and diversity of supply are also important objectives. But again, one shouldn't be indifferent to cost or other options for achieving the same ends. The most obvious strategy for the US would be to focus on fuel efficiency, transportation intensity, and spatial planning... like many 'climate security' approaches there are climate and energy security co-benefits and synergies with these approaches. In Europe, we have a large energy security challenge with gas, and in particular dependency on Russian gas, so the heat-producing applications of biomass has marked co-benefits in energy security. I'm not sure where US gas dependency sits or how much oil is used for heating applications as well as transportation. One might add in the US and EU context that finding new ways to subsidise the farmers and buy-off the farm lobby are also important, if worthless, objectives. I think it is wrong to be against biofuels in principle, at it is possible there are situations where the use of land for biofuel production hits all the rights notes in terms of overall costs and the full range of benefits - cellulosic biofuels on marginal land may be one. But I submit that because we are looking at this issue from the wrong starting point "what to do about transport" rather than how to use land in service of the multiple objectives we have for "land-use services", we never actually make that assessment and so we will rarely do the right thing.. I understand growing trees saves more CO2 than the saving in CO2 emissions by using biofuel. How would growing trees help in these 2 objectives? Anon - who said these two objectives are the right objectives? 1. Change of social geography to more compact societies - reducing the travel intensity of life. A long running planning objective. 3. Various efficiencies with instruments to encourage them: fuel efficiency, driving habits, timing to avoid peaks, occupancy rates/pooling, maintenance, replacement cycle (rate at which old tech vehicles are scrapped and the stock renews), pricing to reflect external costs and reduce journeys that have lower value than their overall costs. 4. Fuel changes to less carbon intensive fuels, when the whole fuel lifecycle is considered. ... you may add a fifth about oil, but that is an energy security issue... and you might expect that high oil prices will deal with that and also promote 1-4 above - each of which reduces oil dependence. The engine technology to use biofuels for 100% fuel is already widely available - and has a large market share in Sweden, so it isn't just some lab in Japan. This isn't actually the problem - the problem is that biofuels don't do what is claimed for them: they providing only modest reductions carbon emissions and oil dependency. And they come with giant opportunity cost - the misuse of land for what we might term poor 'carbon productivity'. Or perhaps worse, the displacement of high value food crops with low value energy crops because of dirigiste subsidy design for fuels - like the RTFO and the European targets that spawned it.